What is Rett's twisted view? Loretta aka "Rett" is a Balloon twister available for Birthday parties, Festivals and business events in Saskatchewan. Loretta affectionately know by friends as "Rett" is Prince Albert Saskatchewan's Premier Balloon twisters. She has added smiles to the faces of young and those young at heart for more than 10 years. The amazement seen in ones face as she twists a balloon in to a latex sculpture is a sight to be seen. 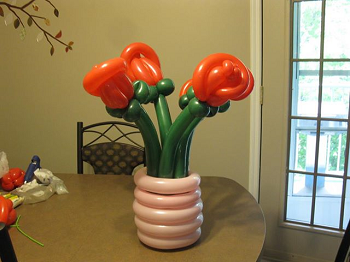 Balloon twisters can make a wide variety of balloon sculptures (see the gallery). These Balloon sculptures add a unique fun, exciting and affordable experience to any event. Rett's Balloon twisting talents have been featured for children's Birthday Party's, Corporate events, Community celebrations, Fairs, Home Comings, and Grand openings. She is a regular feature at The Northern Lights Casino Birthday celebration and is regularly invited back for many corporate events. Rett is also available for bookings in Saskatoon and other locations in north central Saskatchewan. Event participants receive a personal balloon sculpture.The only limit is time booked. The look on adults faces is astounding as they get their own Balloon creation. Balloon twisting provides more fun for any occasion.